The artist Wardha Shabbir lives and works in the city of Lahore, Pakistan, where she not only studied art, but where she also now teaches it. The basis and core of her oeuvre is in many ways quite typical of the scene in Pakistan. The conditions of practice and training there have been heavily focussed on the miniature style of painting that is historically rooted there. There is an emphasis on the precisions of technical ability along with a distinct sense of narrative structure that is formed through figuration. It is through this crux point that contemporary artists in Pakistan work today, and Shabbir is considered one of the new generation of artists that has directed this artistic background towards a more international and aesthetic discourse. 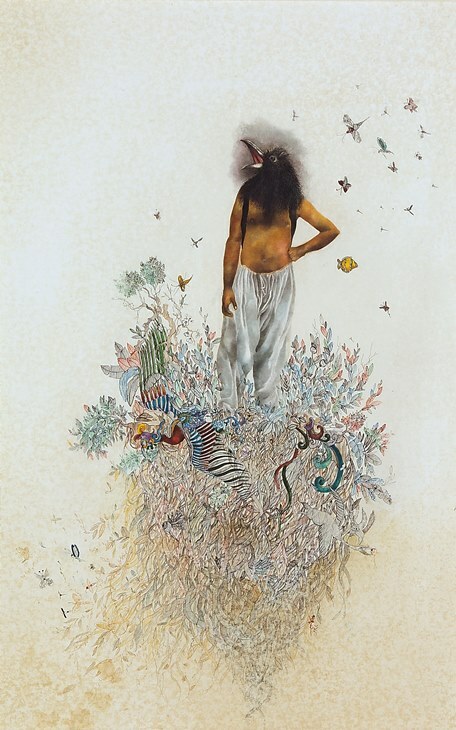 There is a key strand in Shabbir’s work that depicts people transforming into various animals. This is the exemplary feature in numerous of her paintings, such as The Birth of Ve-Vixen (2012) which references the figure in Boticelli’s The Birth of Venus (1486), along with other works like Within the Neglected Soul (2011) and The Nature of Discourse (2010). Each depicting a solitary figure and their heads transforming into animals such as a fox, gorilla or a blackbird. This strand in Shabbir’s work connects strongly with the ideas of therianthropy in cultures around the globe, and also the philosophicalideas of animalism. Her images play with the kinds of universal images of transformational mythology, but which also in turn acts as a sort of metaphorical comment onthe condition of society today, and the direction it is perhaps going in. It might be seen as a comment on civilisational process – the fact that what we understand as “progress” is actually turning many of us into savages. Animalism to many seems as a retrogressive understanding of humanity, yet this philosophical discourse aims to clarify for us that we are all in a sense animals – we are apes from Africa – and it is problematic to think that humans necessarily possess some kind of exceptionality. Maybe the deluded human self is causing itself problems with the idea if its own condition, and therefore must understand itself within the wider ecology of sentient beings. As well as the South Asian painting tradition, there are also nods towards a spectrum of historical western art references too. There is surreal imagery that reminds us of the Early-Netherlandish painter Hieronymus Bosch for example, with scenes of apocalypse and imagery of the downfall of the earthly man. This combination of painting traditions from South Asia and Europe is distinct facet in Shabbir’s work. And it could even be seen as a kind of motivation or attitude – to reconcile these specific approaches to constructing the image. 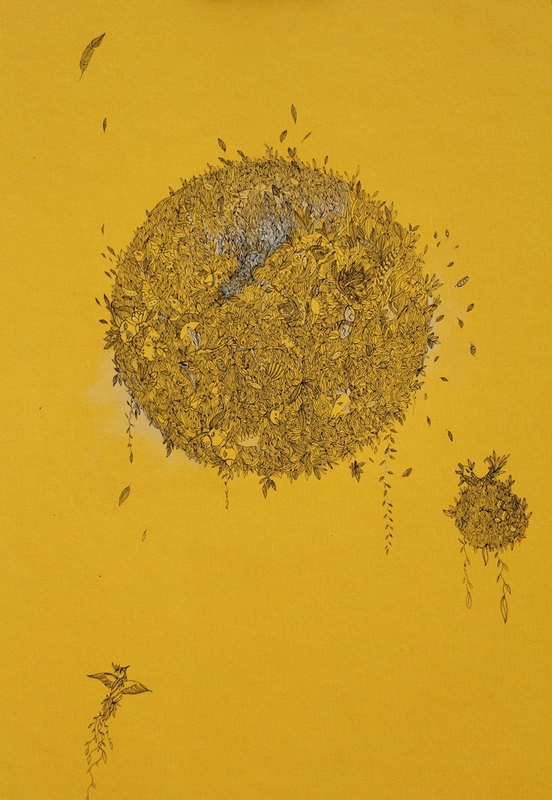 There are also more modern references, particularly though the use of the circle in her paintings, such as in the works Omni Sun (2012), At Once Joined and Divided (2011), which typically incorporate the symbol of the circle as central to their compositions. The circle is of course a motif that was used by American artist Agnes Martin in her minimalist paintings, where it was used to signify perfection. Yet through the use of the circle, Shabbir reminds us that such motifs and uses of geometric forms existed originally outside of the western canon, such as in historic Islamic art and décor, which expressed quite consciously a rejection of representation and idolatry. It was for a total three months that Shabbir spent on residency at FLACC in Genk. It resulted in her most ambitious work to date – the installation Firdous-e-Pasheman (The Firmament of Chargin Chagrin) (2013), for which the use of the circle motif iscentral once more. It marked perhaps a logical development in her practice in terms of aesthetics, experimentation and of scale. 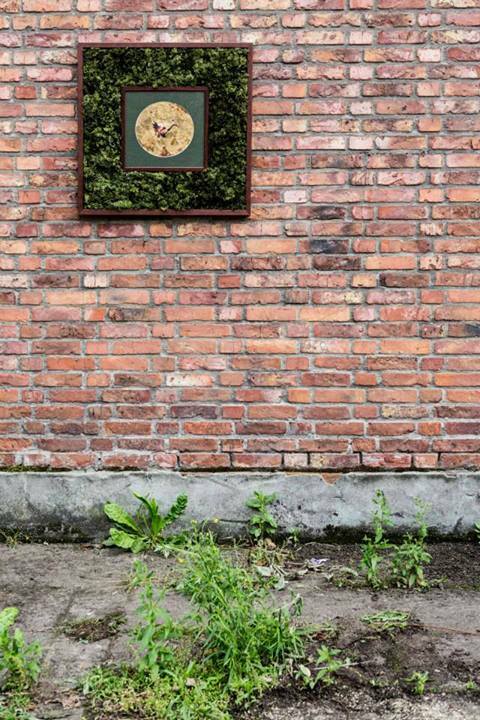 Her main shift into this kind of installation art could be seen with her previous exhibition at Lahore’s renowned Rohtas Gallery, where she presented her installation Many Metaphors (2012). 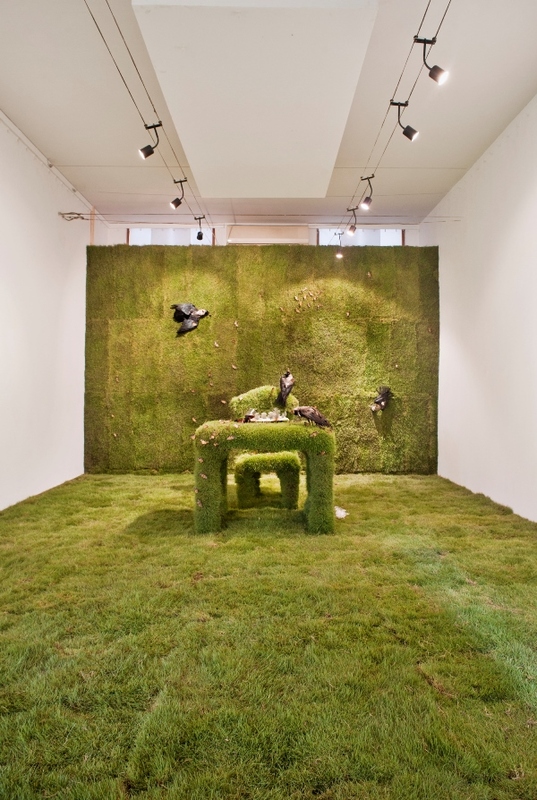 It comprised of a sort of landscape where nature entered the gallery – the floor and furniture were covered in simulated grass, and there were stuffed birds, as well as an uneaten chicken meal at the table that had sat there so long that it had begun to rot. 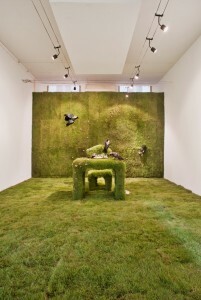 The installation resembled an Edenic scene that had become open to the idea of repulsion. The dual sense of seduction and repulsion recurs in Firdous-e-Pasheman. The architectural structure of the work is that of a circular dome, constructed out of weaved sticks interspersed with fresh flowers. Located in the middle of a grass lawn, it drew you towards its simple yet unusual shape, and coaxed you to enter it. As you walked in, you caused the environment to change in subtle ways. You noticed the temperature change – transitioning from being hot to then possessing a chill. Onto the floor was projected a video – an image of red flowers, which in the space of seconds all crumple and die in a blaze. The image stood in curious contradiction to the temperature. It offers a rather unique, experiential moment where one was unsure how to feel by this sense of attraction and repulsion.